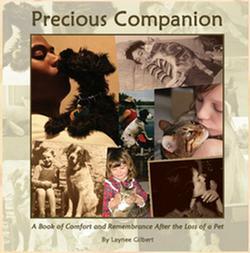 Precious Companion is a sensitive little gift book that provides comfort and solace after the loss of a pet. Filled with poignant photographs and excerpts from authors expressing love and grief for their animal companions, Precious Companion not only consoles through reflection, but also invites the reader to use the book to store one’s own special photos and memories. This is the type of book that I hope every pet owner will buy. It brought tears to my eyes and comfort to my heart. I lost my dog a few months ago, and the verses in the book are so beautiful. This book will touch everyone's heart regardless if you lost a dog, cat, or any type of beloved animal companion. I work for a Veterinary office and see loss on a daily basis, and I know this book will bring comfort to anyone who is grieving their pet companions.